This session lays the foundations for your little one to become a confident and accomplished swimmer. Through using song and constructive play, this session will engage your child whilst teaching them their first swim strokes. One teacher, one student. Open to both children and adults. These sessions allow the instructor to give their undivided attention to just one student. Tailored sessions to help you reach your target, be it finally learning how to swim or improving your stroke for an upcoming race or event. We train adults of all ages, offering private & group classes. Pre-competitive training sessions for children from level 7 and above. 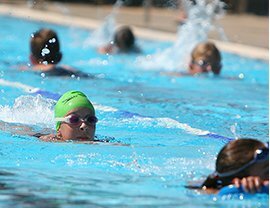 These sessions are suitable for children who are ready to start swimming competitively. My daughter studies for nearly one year and half with it. The teachers are so nice and I really happy to see my daughter’s improvement. This summer my little boy studied with Martin for one class and Abena for two classes, I can’t imagine how he improved. He will be four in October and he is afraid of water, when he was watching his sister swimming he is so curious about swimming but he is afraid to be near the pool and will cry if he was in the pool. The first class he cried for nearly 10mintues and always struggle to hug me, Martin told me to trust him and give him 3minntues alone with my son, surprised me after 3 minutes, my son stopped crying and try to do a little bit in the water:). The second class with Abena, she is really nice person sing the songs and play with my son in the water, I can know my son get rid of the fearness. Only 3 lessons, he got great progress. I do appreciate the teach did to my son. The teachers are very professional and easygoing. It is really worth having a try. All new swimmers are assessed in their first lesson. Following an initial assessment, each learner will receive a grade from which a dedicated swimming program, outlining the proposed stages of their development will be devised. The initial lesson provides an opportunity to discuss and identify development goals. All parents are encouraged to attend the swimming lessons with their kids, in particular parents with toddlers. Kids lessons last 30 minutes which allows us to maximize the effectiveness of the session before the little ones begin to lose concentration. Longer sessions are available upon request. All swimmers are required to book lessons four weeks in advance. Children aged six and above and adults have the option to take lessons in pairs or as a group of three. However, the children who take part in group lessons often don’t progress as fast as those who receive private one to one swimming lessons. 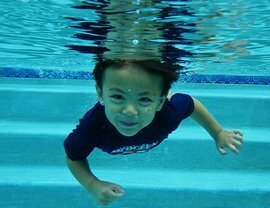 For more information about our swimming lessons, please check our FAQ page. Over the years Goggle and Giggle instructors gained lots of experience offering one-to-one swimming lessons to children with additional needs particularly with Autism and Dyspraxia. We work hard to be inclusive, so if there’s anything you’d like to discuss, please get in touch. It will provide children with a range of exercise, from a small amount of activity and movement to a full-on cardio workout. The fun of messing around in the water allows children to exercise without even realizing it. It can provide stretching and toning exercises, or a full workout that can strengthen the lungs and the heart. Swimming opens the door to other sports and activities, including rowing, sailing, water polo and even becoming the next Olympic or Paralympic champion! Swimming provides challenges, from working through the Kellogg’s ASA Awards to perhaps one day swimming the English Channel. Is the only sport that can save lives. Learning to swim is fun but it also provides health benefits and could save a child’s life. Sadly, drowning is the third most common form of accidental death in children, so learning to swim really is an essential life skill. At present 1 in 5 children in the UK leave school unable to swim. Several studies have shown that babies, who swim within the first two years of their life, develop a greater sense of their surroundings; they become more creative and observant. Swimming burns 3 calories a mile per pound of body weight, which is very important nowadays when children spend most of the time in front of TVs and computers instead of being active. The great thing about swimming is that children of any age, size or ability can take part – and it is more accessible to children with disabilities than most other sports.